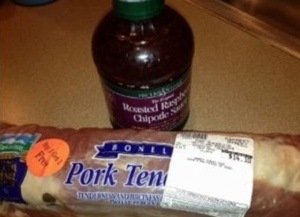 A few weeks ago I found a great deal on pork tenderloin and stocked my freezer. I typically try to purchase a few of these when I see they are on sale at $1.99 per pound which is a great deal… The number one reason I love making this recipe is it’s ALWAYS moist and tender, super easy and foolproof. My dear Mentor Mom Merry made this for our family after we brought Bailey home from the hospital and it’s been Russell’s favorite since. Our sweet Merry passed away this past January and I’ve found comfort in making this and remembering all of the special times we shared together, she was a very special woman in my life. Here’s how you make it! Grease bottom of roasting pan. 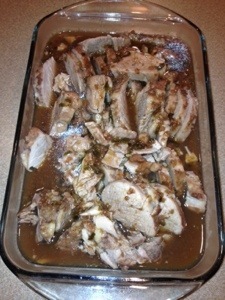 Pour half of chipotle sauce in bottom of pan, place tenderloin in pan and pour rest of bottle over the top. Baked covered at 325 degrees for 1 1/2 hours. Let it sit for about 20 minutes. Serve sliced with vegetables or rolls. Enjoy!